Lot 702. Severus Alexander. A.D. 222-235. AR denarius (18 mm, 2.48 g, 6 h). Rome, A.D. 232. 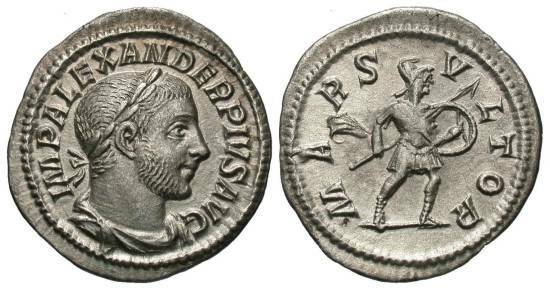 IMP ALEXANDER PIVS AVG, laureate head of Severus Alexander right / MARS VLTOR, Mars standing facing, head right, holding spear and shield. RIC 246; BMC 833; RSC 161a. Light grey toning. Good very fine.